The NAPLEX[registered] (North American Pharmacist Licensure Examination[registered]) is the standard licensing exam that all U.S. pharmacy students must pass to practice pharmacy. It's an arduous exam that tests a daunting range of knowledge. Approximately 10 per cent of students taking the exam for the first time fail to achieve a passing score. Preparing for the NAPLEX[registered] by reviewing all the material from each pharmacy school course would be overwhelming. A far better approach would be to study only the information most relevant to the exam, summarized in abbreviated bullet format, and that's what The APhA Complete Review for Pharmacy contains. 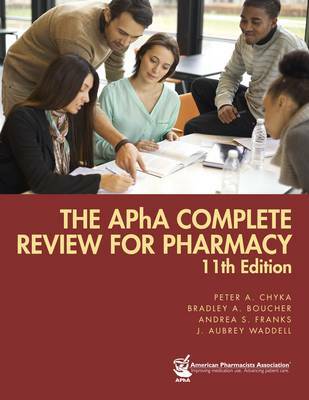 A one-volume compilation of pharmacy knowledge, The APhA Complete Review for Pharmacy is also a popular reference for busy practitioners wishing to stay current. Features: all 42 chapters and 900+ review questions have been reviewed and revised by the authors and editorial team to provide up-to-date information and concepts, plus explanations that reinforce key learning points; the tables that list medications now indicate the top 100 drugs in boldface to alert the reader to medicines in frequent use; and, the Key Points section, which is a summary of a chapter's concepts, has been moved from the back of each chapter to the very front. It is followed by a new feature, the Study Guide Checklist, which is intended to help readers assess their readiness for the NAPLEX[registered]. Seasoned advice from Peter A. Chyka on studying for and taking the NAPLEX[registered] and MPJE[registered] is provided.